Established in 2015, Zero-D Industries Pvt. Ltd. has emerged as the undisputed leader in the industry of manufacturing, wholesaling and service providing for a reliable range of clean and green water treatment solutions. Our range of products include FRP Toilets, Portable Toilets, Portable Urinals, Effluent Treatment Services, Process Intensification Services etc. Despite our recent foray into the industry, our products are being used in India’s top Chemical, Pharmaceutical, Biotechnologial, Agriculture, Paper, Textile, Dyes, FMCG, Petrochemical and Real Estate industries. Many of these customers vouch by the quality of our products, which are manufactured with optimum grade raw material procured from authentic market vendors. Our products, credited for their durability and precise design, can be availed in customized sizes, dimensions and technical provisions, per client specifications. “A cleantech company, we not only secure but hope to improvise the future of the industries.” This motto has been imparted on us by Mr. Pratik Sangave, our Director. Mr Sangave’s expertise of the market is unmatched and his strong ethics are contagious. Our in-house Quality Control team is working round the clock to ensure that only approved products are sent to the Warehousing unit for shipment. These quality control officers thoroughly check each product based on strictly-defined parameters. Moreover, our clients are aware that we only utilise Grade A raw materials to carry out manufacturing processes. Our production processes are carried out in a vast facility located in Thane West, Maharashtra. This facility is equipped with latest machinery and equipment. We also have a packaging and storing unit which ensures timely handling and security of products. 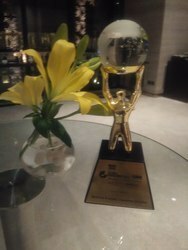 Best Eco-friendly solution award in Clean and Green India 2016, New Delhi.